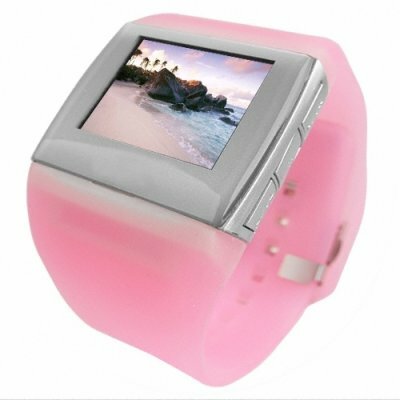 Successfully Added 1.5 Inch OLED Watch MP4 Player 4GB - Ladies Pink Quality Strap to your Shopping Cart. Cute 4GB MP4 watch brought to you by the premier site for all the newest and best MP4 player technology, Chinavasion. This product features a super bright 1.5 Inch OLED LCD screen and a colorful and durable pink polystyrene strap sure to please any little girls heart. This one of a kind looking MP4 watch comes with a fully functioning date and time display, high fps playback of digital movies, an FM tuner for 2 different regions, and even a mini MIC for recording what people are saying without them ever being the wiser, and all with a easy to navigate full color GUI interface. Unique new MP4 gadget, sure to please that special someone, direct from China to your door..